High flying doves will pass in close when they spot these life-like decoys. Each is designed to grip branches for strategic placement. Model #F5930. These decoys really work! 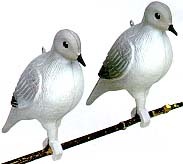 Authentic Flambeau dove decoys.